Ever ran out of no-decompression time, but still had half a roll of film left in your camera? Ever had to end your dive after seeing only half of the wreck? Ever wished you could stay in the water for just that little bit longer? Well, with the PADI Enriched Air Diver Specialty Course, you can. The PADI Enriched Air Diver Specialty Course is designed to familiarize you with the skills, knowledge, planning, organization, procedures, techniques, problems, hazards and enjoyment of Enriched Air diving. 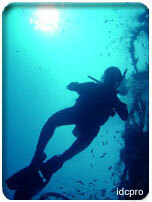 The course will serve as a supervised introduction to diving using Enriched Air containing 22% to 40% oxygen. The PADI Enriched Air Diver Specialty Course will allow you to use Enriched Air while diving, giving you more time to take photographs, more time see the rest of the wreck, or simply more time to enjoy your dive. Time is precious, don't delay! Enroll on the PADI Enriched Air Diver Specialty Course with us today and stop wasting your precious time!